The first thing I did was make my 5V power supply from a usb cable. Using an old iphone cable, I cut the iphone side off and fished out a red and black wire. I soldered some sturdier wires to this, and plugged it into a wall adapter. Checking with a voltmeter, this gave me 5V output. Now time for the GPIO. Water Sensor - plug the positive lead from the water sensor to pin 2, and the negative lead to pin 6. Plug the signal wire (yellow) to pin 8. Relay - Plug the positive lead from pin 7 to IN1 on the Relay Board. Also connect Pin 2 to VCC, and Pin 5 to GND on the Relay board. Pump - Connect your pump to a power source, run the black ground wire between slots B and C of relay module 1 (when the RPi sends a LOW signal of 0v to pin 1, this will close the circuit turning on the pump). This diagram should capture the correct GPIO so long as you are using Raspberry Pi 3. Not shown is another power source to the RPi. 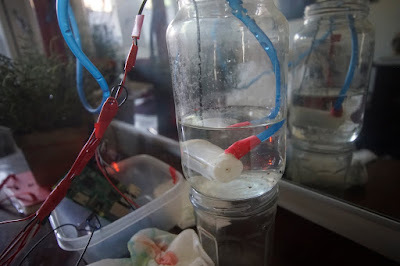 Once the wiring has been completed, attach the flexible hose to the pump (I used electrical tape), and drop it into a jar of water. Attach the other end of the hose to your plant. Now plug in all power sources (and make sure your Raspberry Pi is running some version of an operating system, like this one here). Note: If you get the wiring exactly as described above, my code in the next section will work with no modifications. There are two parts to this setup. One file controls all the GPIO and circuit logic, and the other runs a local web server. With that installed, you should be able to use the water.py script found here. This should print a statement about whether your sensor is wet or dry (get_status()), and also turn on the pump for 1s. If these work as expected, you're in good shape. At this point you can also calibrate your water sensor. If your plant status is incorrect, try turning the small screw (potentiometer) on the sensor while it is in moist soil until the 2nd light comes on. The next aspect of this project is to setup the web server. This code can be found here in a file called web_plants.py. This python script runs a web server enabling various actions from the script described above. You will need to keep web_plants.py in the same directory as water.py described above, as well as auto_water.py. You will also need a sub-directory called "templates" containing the html file here called main.html. You will also need to create a sub-directory called templates, and place main.html in the templates directory. Try clicking the buttons to make sure everything works as expected! If so, you're off to the races. Finally, you probably want the website to auto start when the RPi gets turned on. This can be done using a tool called cronjob, which registers your website as a startup command. Now when you reboot your pi, it should auto start the server. Can we use Solenoid valve instead of mini micro submersible pump, Sir? Yes you could use a solenoid valve, but the water would still have to be moved somehow. I have been thinking a gravity fed water line with a solenoid valve would be the best solution for something like a garden. Good luck. Sir, solenoid valve needs a 12v source. It is ok to connect it to the 5v relay module? If it's 12V in the circuit the relay closes you should be fine though. If you're powering the relay itself with 12V, probably not good for the longevity of the component. Sir, for the Soil moisture what is the exact pin you use? The Digital Output or Analog Output? I'm getting a "ImportError: No module named psutil" when im trying to run the web_plants.py even i already installed the module psutil, any advice for this? I am testing the auto-water feature but the consecutive_water_count does not remain at 0 when I leave the sensor out on a napkin. I wanted to see how long the pump would keep activating until the consecutive_water_count reached 4 (starting at 0) - knowing fully that it would never reach because I don't have it in water. Thanks for all the details. Can this setup be extended via WiFi as iot.what hardware/board can be used. Can you supply power to both the pi and the pump with the 5v? Or will the pi need to be plugged into main somewhere? can you give me report please? Hi, How would this work if it was controlled from an Android App? Great project! I followed it and got it to work as well.... nice! Could you help me understand the soil humidity sensor though please? In the diagram a 3 pin sensor is used, in your vids you a different one with 2 pins... I have ordered such one, but I don't know how to connect and properly calibrate. Same problem here!! Did you ever figure it out? So I think the two wires you're seeing are just extensions of the circuit between the moisture pins... They connect to a tiny pcb with an LED on it where the sensitivity of the sensor is calibrated, and then 3 wires come from that tiny PCB back to the Pi. So its like in the diagram, but with wires running to the prongs of the sensor. Basically the sensor needs power (red and black) and a signal (yellow). Your red and black (VCC/GND) should connect to the input voltage, and yellow(OUT) should go to the RPi GPIO pin 8. Hi again! It turns out the potentiometer had 4 pin outputs but you only have to wire 3 to the raspbery pi as one is digital output (DO) and one is analog output (AO) as we are using digital hardware, you just wire the ground, VCC (power) and DO (digitaloutput) Thanks for your help though! Currently testing mine on the floor! I want to thank you for this script. I customized it a lot for my Garden. I did notice if you have the timer for water pump on long time and you end auto water. it does stop the script but the valve is still active and never shuts off. I added a line to cut off the pump prior to psutil to kill the script. I also added functionality to add more sensors. works sweet.